Learn to memorize. The human brain easily absorbs information, stories, names and faces that easily catch its attention. This is why people who watch movies immediately respond to how the story is made or what the story is all about because of the interest and attention the brain is capable of acquiring as the movie runs. In creating stories out of pictures or images, motion helps a lot in connecting the unrelated objects. Studies show that when there is motion among objects, it makes it a lot easier for the human brain to absorb details from the situation. Let's see if you can remember several objects at a time. Let's take shoes, door, cake, fish, mountain and ceiling. The given objects are all completely irrelevant from one another. 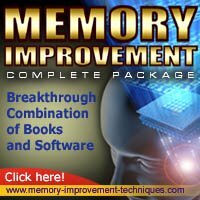 But by using the snapshot memorization technique, we can create a scenario which makes it easier for us and our brain to absorb the above mentioned. A pair of shoes woke up one day upon hearing a knock on the door. To Shoes' surprise, a big cake waits on the front door. Shoes takes the cake in and delighted by the surprise, decides to take a bite when all of a sudden, a humongous fish jumped out of the cake carrying another gift in hand. The fish gave Shoes its gift. The gift is a picture of a mountain Shoes always wanted to climb. Thrilled, fish and Shoes placed the frame on the ceiling and looked up at it with awe all day. After reading the paragraph, an immediate recall is possible about what happened to the mentioned objects in the scenario. The reason is, moving objects are far less complicated to imagine and remember. Try making another one and see for yourself how much you can remember.